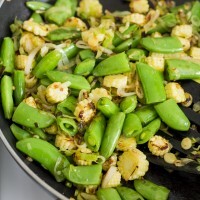 Beautiful colour, tasty, a little sweet even — what more can you ask for in a veggie stir-fry! This is an easy one to make. 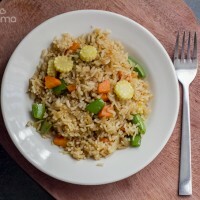 Like many rice mix dishes, it’s a great way to refresh leftover plain rice. So you can plan ahead and make lots of rice today, and do fried rice the next day, cutting prep time for a meal. 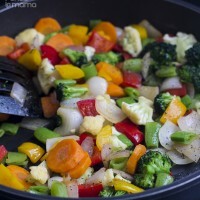 A big part of making quick meals can be planning ahead with the meal you’re making today. Just make a little extra to use a different way tomorrow.